“I never see you wearing your monk strap shoes from Nunes Correa anymore…” read a rather sad recent comment on one of my blog posts. I felt a pang. It is true, I no longer wear my beautiful burgundy double-monks which I had purchased on a splendid holiday to Lisbon about four years ago. However, the reason for this is that I had finally acknowledged what I had really known all along, but attempted to ignore; they were simply too small for me. When I tried them on in the shop, I just squeezed in and felt the stiff leather tight around the top of my foot. Rather foolishly, I calculated that they would be the perfect size once my heat-swollen feet were back in chilly Blighty. Wearing them several times caused some of the most acute pain I have experienced and provoked me, on more than one occasion, to curse both my vanity and naive optimism. I started wearing them, Sartorialist-style, unbuckled, but the pain was still there and I looked rather like a naughty schoolboy who would steal sweets from the local newsagent. There was no choice; my prized bargain from the Portuguese summer sales had to go. Since then, I have been looking everywhere for what is, probably, the most unique creation to be crafted on the cobbler’s bench. Not a loafer and not a lace-up, the monk strap sits somewhere between the two. Though often worn with more casual clothing, it looks splendid with worsted wool although, as with loafers, trouser breaks should be kept to a minimum. The wrap-over strap-and-buckle gets it’s name from European monks who, requiring a simple and functional shoe, chose this design for being more protective than sandals but comparatively easy to remove. 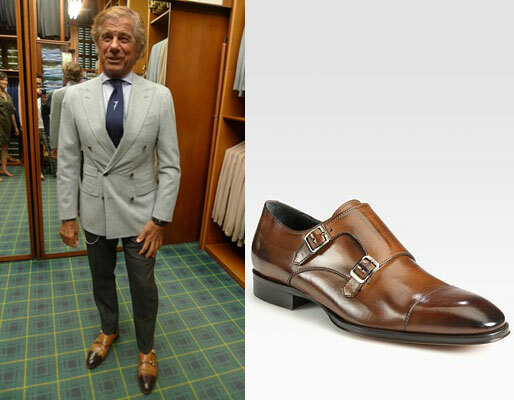 It is delightfully ironic that a shoe favoured by those who eschewed the pleasures of fashion is now the footwear of choice for a great many flamboyant dressers, particularly the fabulous Lino Ieluzzi. I greatly prefer the double buckle as the buckles themselves are not only smaller but they wrap over a greater portion of the shoe than the single buckle. The splendid Nunes Correa no longer offer this design, and sadly, the double-strap design is no stranger to eyewatering prices. One of the more beautiful options is the Langley by To Boot New York, available exclusively from Saks Fifth Avenue. With a heavily burnished toe and heel, they have the depth of an oil painting and at £260 are at the more-reasonable end of pricing. Also recommended are the Joseph Cheaney ‘Holyrood’ in Bronzed espresso, the Alfred Sargent ‘Ramsey’ and the Herring ‘Attlee’, although with these models any serious burnishing – a must with monks – will have to be self-applied. Shame the guy in the picture is so appallingly dressed. Older men in skin-tight trousers is very wrong (‘mutton….’), the jacket is ill-fitting, and the mismatches and clashes cannot be knowingly called ‘sprezzatura’. You’re going to tell me he’s a style guru now, aren’t you? The shoe is over burnished to the point of clownish. Double monks are 1 monk too many. I agree on the poor clothing choices displayed in the photo. Just visited Puerto Rico with my wife this fall , and to my delight a Zara store in San Juan . I bought a pair of brown double strapped Monks for $99.00 US and they look and feel awesome . The “well dressed” community that i know here in Memphis surely think i paid Hundreds of dollars for them.